45 Lukie Points will be rewarded to you when you buy this. Original Sega Genesis (version 2) system in GREAT condition! This system has been tested and is guaranteed to work! Backed by a 1-year warranty. As usual. Lukie Games out do themselves. The Console looked in great condition. Yes it came with the 3rd party small controllers but there were two. And i got it for my daughter's so it's all good. I got a rgb scart cable and a scart to hdmi converter box for it online elsewhere. So now its display is looking great and far better than I've ever seen it play before since i had one as a kid. I got it hooked up to our 4k tv. Just great great stuff. Thanks Lukie Games. Some of the buttons won't respond when pressed. It appears the controller needs to be re-soldered. It could have broke during shipping. This was my first purchase of anything retro gaming so was nervous as what to expect. I was pleasantly surprised. The console itself is extremely clean, you wouldn't believe it is 24 years old. The console and the 3 games I got all worked as did the controllers however, as other reviewers have said, the controllers which are not original Sega items are very poor quality. The joypad keeps coming off one of them. Everything was very well packed and Lukie Games had even added an information sheet with some simple but helpful advice. My first experience has gone above my expectations. great product,except for the controllers..All in all I'd refer anymore to lukie games..You guys are great!!! It's awsome I really like it was excellent shape. I'm going to keep ordering form lukie games there best website. What can I say, it's like a dream come true. I got the urge to play an old favorite, StarFlight, lo and behold it's actually quite difficult to find an old school Genesis, and now they have these knockoff consoles (loaded with 100+ games) which I hear are not quite the same. I got a legit old school (looks new) Sega, everything works great, controllers are fine, got here quick... Hmm, Maybe I'll get a 32X.. The SEGA Genesis console I ordered works great. 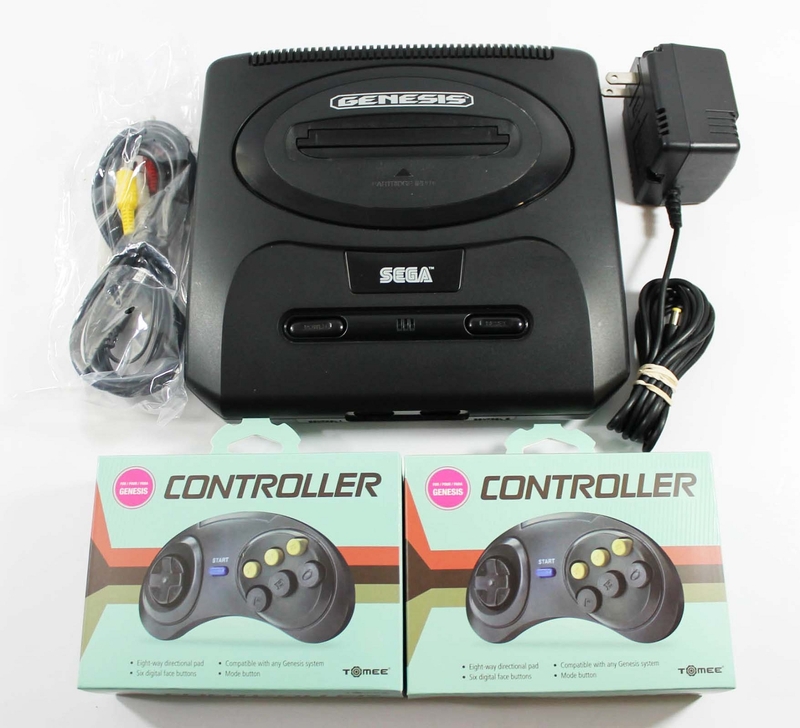 However, the two generic controllers which came with the set are absolute junk. The directional pad falls off constantly, so I super glued them to the directional ball joint. However, they have since broke. I ordered two more pairs, expecting these ones to just be a fluke, however, they are absolute junk as well. I was excited to play a system I hadn't been on in 20 years. All the equipment was included at a great price. Thanks again. I made a great decision choosing Lukie Games to order my Sega Genesis from and it arrived in great condition and also works perfectly fine. Lukie Games is a great company to order anything from and I hope it stays that way. System arrived quickly and in great condition. Great product I'm glad that this company is around. 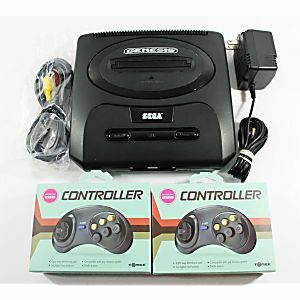 Sega Genesis is one of the best gaming consoles out there and I really enjoy the games. The condition of the system that Lukie Games sent me was fantastic and I can't reccommend them enough. Only problem is the controllers are 3rd party ones and feel cheap compared to the 1st party ones.